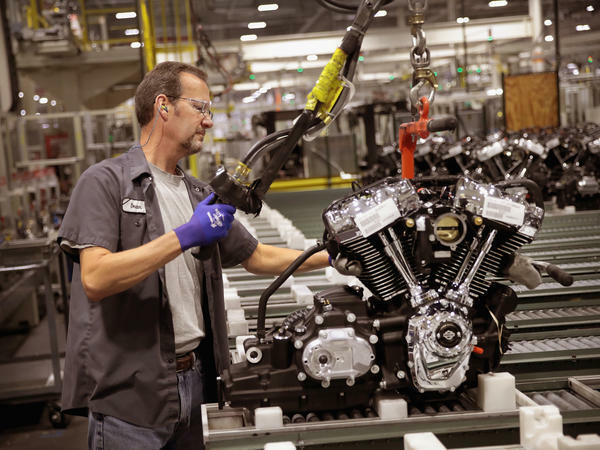 Harley-Davidson motorcycle engines are assembled at the company's plant in Menomonee Falls, Wis. Tariffs from the European Union are prompting the company to shift production of some motorcycles for the European market overseas. European officials last week imposed stiff tariffs on a wide range of U.S.-made goods sold within the European Union. The move came in response to Trump's recent decision to slap tariffs on European imports. In a Securities and Exchange Commission filing Monday, Harley-Davidson said the tariffs imposed by the EU "would have an immediate and lasting detrimental impact to its business in the region." The European tariffs have jumped from 6 percent to 31 percent, the company said. That increase will add $2,200 on average to the cost of each motorcycle sold in the EU and cost the company $90 million to $100 million a year, the filing said. "Increasing international production to alleviate the EU tariff burden is not the company's preference, but represents the only sustainable option to make its motorcycles accessible to customers in the EU and maintain a viable business in Europe," the filing said. Trump has frequently heaped praise on the company as a strong manufacturer with a long history of making motorcycles domestically. But after Monday's announcement, Trump said the company should be patient, noting, "ultimately they will not pay tariffs selling into the E.U., which has hurt us badly on trade, down $151 Billion." It also did not say which U.S. factories would be affected. The company's U.S. factories are in York, Pa., and Menomonee Falls, Wis. It plans to close another plant in Kansas City, Mo., next year. Leaders of the unions representing the plant workers say the company has been gradually shifting production to plants in India, Brazil and Thailand for some time. "Harley-Davidson's announcement today is the latest slap in the face to the loyal, highly-skilled workforce that made Harley an iconic American brand. Harley pounced on news released Friday regarding EU tariffs on Harley motorcycles and the company will be implementing plans to offshore more production. "Even before the EU's announcement, Harley made the decision to close its plant in Kansas City and has manufacturing facilities in India and Brazil. It also announced a future plant in Thailand. This latest move is in keeping with Harley's past decisions to open plants outside of North America. "Will Harley use any excuse to ship jobs overseas? Does Harley even understand what 'Made in America means?'" Republican Sen. Ben Sasse of Nebraska, who has criticized the Trump administration's reliance on tariffs against U.S. trading partners, took issue with Monday's tweet. "This will go over like a Vespa at Sturgis. The problem isn't that Harley is unpatriotic — it's that tariffs are stupid. They're tax increases on Americans, they don't work, and apparently we're going to see more of this," he said. Harley-Davidson declined to comment beyond the filing released Monday. President Trump tweeted today that he's surprised that Harley-Davidson is moving production of some of its motorcycles overseas, and he's urging the company to be patient. Harley-Davidson says it will manufacture some of its motorcycles abroad to escape rising European tariffs. NPR's Jim Zarroli reports. JIM ZARROLI, BYLINE: Harley-Davidson is the quintessential American brand, a name that conjures up freedom and the open road. UNIDENTIFIED NARRATOR: We believe in going our own way no matter which way the rest of the world is going. ZARROLI: And Harley-Davidson is a very American company in another way. It does most of its manufacturing in the U.S. Partly for that reason, President Trump often heaps praise on Harley-Davidson. During a joint address to Congress in 2017, he said he had just met with officials at the company. PRESIDENT DONALD TRUMP: In fact, they proudly displayed five of their magnificent motorcycles made in the USA on the front lawn of the White House. ZARROLI: But the company is now breaking ranks with Trump over his trade policies. This spring, the White House imposed tariffs on European imports. Europe quickly retaliated, making a variety of American goods more expensive, including motorcycles. Europe is Harley-Davidson's biggest foreign market with almost 40,000 customers there last year. Darwin Holmstrom has written several books on Harley-Davidson. DARWIN HOLMSTROM: I was just to Sweden, and I actually saw quite a few Harleys, relatively speaking. There's a core market that wants to sort of have this American biker image. ZARROLI: The European tariffs would raise the cost of each motorcycle sold in Europe by about $2,200. Today, the company said it would try to avoid the tariffs by moving production overseas. Harley-Davidson has plants in Wisconsin and Pennsylvania, and it already had plans to close a third factory in Kansas City next year. Joe Capra is with the International Association of Machinists and Aerospace Workers, which represents the plant's employees. He's no fan of President Trump's tariffs. JOE CAPRA: We are going to end up with a trade war that's going to cause us to have less production over here, and prices are going to go - skyrocket. ZARROLI: But he also notes that the company is already slowly moving production overseas to plants in India and Brazil. The quintessential American brand is becoming less American, and the current trade tensions promise to accelerate the process. Jim Zarroli, NPR News, New York. Transcript provided by NPR, Copyright NPR.